What are the best anti-hair loss treatments? No one ever said that beating hair loss would be easy - but it is achievable, and you also don't need to fork out for an expensive hair transplant to solve your problem. 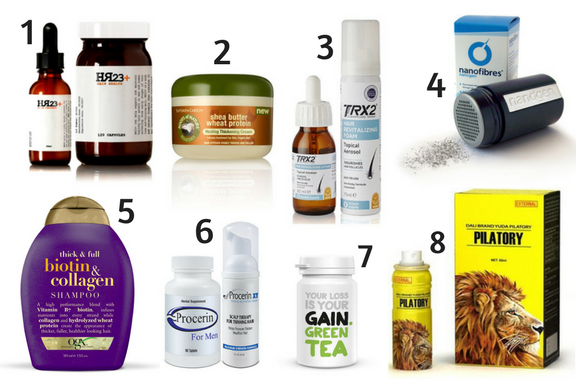 Over the months we've brought you a range of varied anti-hair loss recommendations, spanning from serums and shampoos, to supplements and electronic devices. Here, we take you though the ultimate top-eight products to try if you are suffering from early stages of baldness and thinning hair. It should be noted that one cannot use all these products simultaneously, so as a broad recommendation, just pick one or two that you feel will work best for you. If you're looking for an effective double defence system against hair loss, then be sure to consider HR23+ Serum and HR23+ Supplement. Containing KGF and Saw Palmetto, HR23+ Scalp Therapy Serum is one of the most potent formulas you will find on the market, but fear not, it is completely safe to use, so you won't suffer from any side-effects. The supplement contains 23 key ingredients that are designed to prevent the rate of hair fall and promote the formation of hair growth. This potent supplement is the fastest growing supplement of its kind on the market. Hair proteins are becoming increasingly popular, and it's not just women who are purchasing this stuff - men are jumping on the bandwagon too! Weak hair strands crave for protein, which helps strengthen the hair, therefore adding a good hair protein to your hair care routine is actually quite essential, especially if you want stronger, thicker looking hair. These two releases are fairly new from Oxford BioLabs, but we are assured they are more effective than the 'hit-and-miss' supplement. TRX2 Lotion and TRX2 Foam are both consistent with the potassium based supplement, but with a more expansive blend. It's still rather early to predict how well these formulas can work for hair loss, but they could well be worth a try if you are suffering from damaged or weakened hair follicles. The hair building fibre is not a treatment for hair loss, but rather a concealer. Hair building fibres give male and female users a great lift in confidence, enabling them to live happier and more productively. For covering bald patches on the scalp, hair building fibres is the ideal quick-fix solution. Many people even use them after undergoing hair transplantation, n order to cover scars and marks as their new hair grows in. Simply the best and most affordable shampoo of its kind on the market. If you're looking for a shampoo that can help prevent unnecessary hair fall and promote stronger, thicker looking hair, then be sure to try OGX Biotin & Collagen Shampoo - which can be purchased from your local Boots stores and most supermarkets. Procerin is the biggest selling hair supplement for men in America. The whole range consists of tablets, foam and shampoo, with the tablets being their best selling product. With a potent blend of ingredients including Saw Palmetto, Procerin can block the formation of DHT (the cause of hair loss) and encourage healthy hair growth. With a 90% success rate (or so their website claims), As low as £15 per bottle, Procerin is well worth a try if you are male and suffering from early stages male pattern baldness. Green tea is a good source of panthenol, which is often used in shampoos and conditioners to strengthen hair and manage split ends. Panthenol, along with the other antioxidants present in green tea, may help in strengthening the hair and making it healthier. Consider adding green tea supplement form into your hair care routine for stronger growing hair. With apparent positive customer reviews, Yuda Pilatory Spray is distributed globally, and is particularly popular with men battling the common condition of a thinning crown. Yuda claim to use 5% Minoxidil in their spray, which would explain the positive results in customers who have tried this product. Minoxidil is the only FDA approved liquid treatment for hair loss on the market. Containing the hair beneficiary ingredients Herbal Ginseng extract, Angelica extract, and Polagonum multiflorum extract, this product claims to stimulate blood circulation, improve the functioning of hair follicles, control hair loss and promote hair growth.